Friday March 9th 1900 We got an early start to town. It rained on us a little I did not stop in town at all. Found Lee about the same. I was at Fannys in the afternoon. It cleared of since when we came home. We read all the evening. Saturday March 10th 1900 Will caught a ride to town. I did ironing and bread baking and some sewing. Luther at work at the posts. It was pleasant and the snow is going very fast. Sunday March 11th 1900 I was busy nearly all the forenoon with the work. Luthers brother was here for dinner. I wrote in the afternoon and read in the evening. Monday March 12th 1900 I did a little extra work about the house and got dinner early to send up to Luther at the wood pasture Callie was up to see me most of the afternoon. 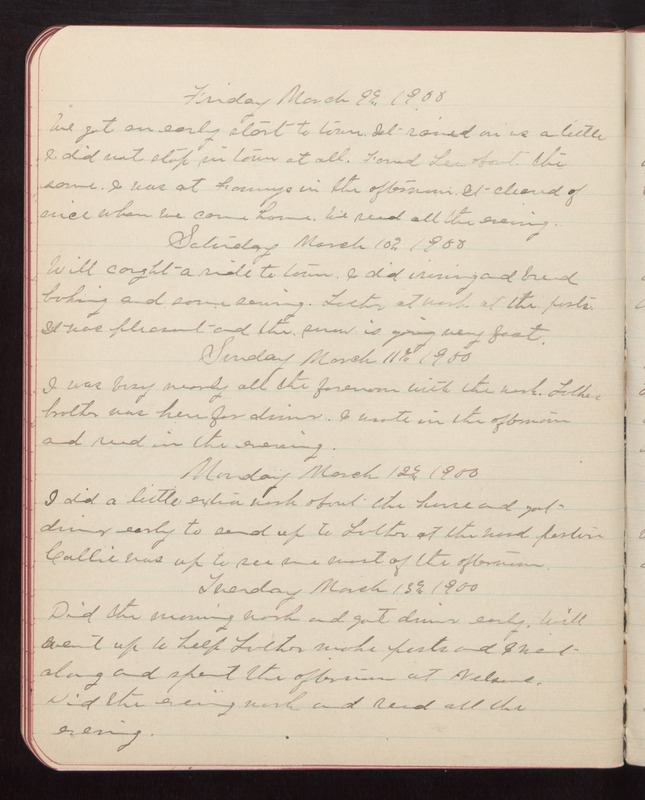 Tuesday March 13th 1900 Did the morning work and got dinner early. Will went up to help Luther make posts and I went along and spent the afternoon at Nelsons. Did the evening work and read all the evening.